Uniquely designed in red white and blue colors of Old Glory, this knuckle buckle is for the most patriotic collectors. USA is carved out in bold relief in the middle of this solid steel buckle knuckle. Comes with belt stud. Weighs: 180 grams or 6.34 ounces Very unique and awesome belt buckle. 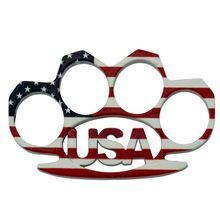 Brass Knuckles of any material are not legal and therefore cannot be sold to people in the states of: MA,CA,NY,MI,RI and IL. Metallic Knuckles may not be sold to FL.